Call for specific availability and deals! 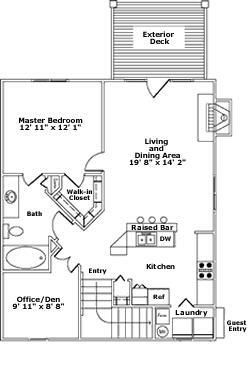 Choose from 4 award-winning 1 bedroom/1 bathroom floor plans! Some with attached garages, an office, a fireplace, vaulted ceilings, and wooded views. Only 1.5 miles from Indiana University and on both the 3 and 9 bus routes to campus. Call today to set up a tour. Ask about our Grad Deals! The Woods was custom designed to reflect the pastoral beauty of the original Latimer Farm site and to highlight the surrounding nature conservancy. Designed and constructed with great care and attention to detail, each home boasts handcrafted woodwork and Vermont slate accents. Among its several honors, the Woods has received Prodigy awards from the Apartment Association of Indiana for such distinctions as Best One-Bedroom Floor Plan Design, Best Landscaping, and Best Exterior Signage. The Woods is also unique in its location. Despite its lush natural setting, it lies within three miles of Indiana University and in walking distance to shopping and restaurants. It is located off a major thoroughfare and is also on local bus routes.